Summary: I	X Web Hosting just released the cheapest hosting plan that we know of. IX Web Hosting just released the cheapest hosting plan that we know of. $3.95/month for their regular hosting plans. 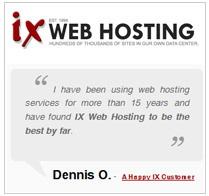 If cheap hosting is what you’re looking for, make sure to take a look at IX Web Hosting.